TeliGlobeTM is a mobile softphone application for both Apple iOS and Android devices, enabling you to participate in the fast-growing market for Mobile VoIP. This cloud-based mobile softphone can be downloaded for free by your end users from both the Apple App Store and Google Play. TeliGlobe enables you to easily add a mobile option to any VoIP service that you offer using Telinta’s hosted softswitch and billing solutions. Generically-branded version, with an attractive set of pre-defined features. Your own app in the App Stores, with your brand and your own App Store icon. 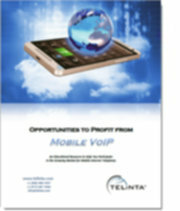 Click here to see a sample Mobile VoIP webpage. What is a Mobile Softphone? A mobile softphone is a smartphone application which enables end users to both make and receive “over the top” (OTT) VoIP calls. Using the device’s mobile data connection or WiFi, the mobile softphone functions just like any other VoIP end-point which can be used on Telinta’s cloud-based softswitch platform. Telinta’s unique TeliGlobe solution combines cloud-based switching and billing capabilities, enabling you to offer brandable Mobile VoIP services to your customers. Mobile VoIP can be offered either on a stand-alone basis or integrated with one of our other VoIP solutions, such as adding a mobile extension to a Hosted PBX. Your customers can use TeliGlobe with both Apple iOS and Android devices. Applications for TeliGlobe and TeliGlobe Elite can be downloaded for free from iTunes and Google Play. How do I brand the softphone? Telinta offers two options for a branded mobile softphone solution. TeliGlobe is a generically branded application that your customers can easily download and use. A generic brand appears in the app stores and a generic icon appears on their phone. TeliGlobe Elite provides you with your own branded app and icon listed in the app stores; your own custom-designed branded icon appears on your customer’s phone. Is the G.729 codec available? Yes. Telinta customers can opt to add the G.729 codec at extremely attractive rates. Can I integrate TeliGlobe with other Telinta solutions? Yes. TeliGlobe can either be offered as a stand-alone service, or conveniently bundled into any other VoIP service you provide via Telinta’s softswitch and billing platform. You can offer a mobile extension to your business customers using Hosted PBX. Consumers on-the-go can use your mobile VoIP service to enjoy a second phone line on their smartphone using WiFi and mobile data. Can I offer free calling between my users? Yes. TeliGlobe also enables you to offer free on-net calling between your TeliGlobe users without using the PSTN and without using VoIP Termination or DIDs.